We’ve thought of everything and included it in this deluxe, creme de le creme gift basket. A seasonal, Christmas favorite! 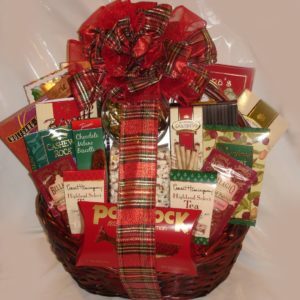 We’ve thought of everything and included it in this deluxe, crème de le crème gift basket. It boasts layer upon layer of delectable treats. 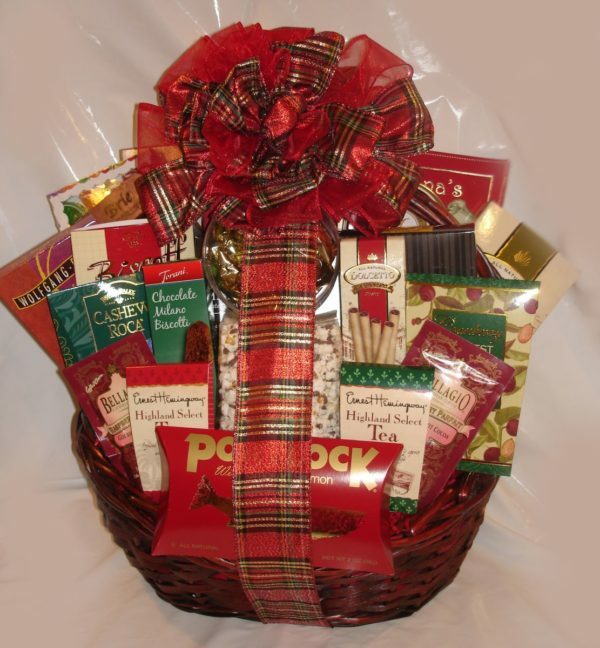 An ideal gift for an office or family gathering – something for everyone! Please Note: This oversized gift is for local, courier delivery only. Godiva Chocolates, Exquisite Pralines, Double Chocolate Meltaways, Peppermint Roca, Belgian Truffles, Sweet Buttery Cookies, White-Chocolate Covered Hazelnut Biscotti, Caramelized Cookies, Chocolate Chip Pecan Cookies, Cashew Roca, Ghirardelli Chocolates, Vanilla-Filled Wafer Rolls, Chocolate-Filled Crepe Pastries, English Tea Cookies, Tiramisu Wafers, Smoked Salmon Fillet, Chocolate Crunch Cookies, Keylime Cookies, Tuscany-Style Crackers, Olive Oil & Sea Salt Crackers, Summer Sausage, Spanish Olives, Chocolate Drizzled Popcorn, Cheese Straws, Pastry Straws, Dried Fruit Medley, Smoked Almonds, Three Varieties of Fine Cheese, Tea, European Coffee, Mocha Latte Mix, Cocoa, and Godiva Truffle Coffee.